The number of refugees who have fled to Korea for sanctuary now exceeds 35,000 including those whose applications are still pending. Korea only accepted its first refugee in 1994. Altogether 40,470 have applied for refugee status, and 35,030 are here now, the Justice Ministry said Friday. That means refugees outnumber the 31,500 North Korean defectors living here, who automatically get South Korean citizenship. According to the UN, a refugee is a person who "owing to a well-founded fear of being persecuted for reasons of race, religion, nationality, membership of a particular social group or political opinion, is outside the country of his nationality." The Korean government also gives asylum to people who are threatened with physical violence even without political reasons. Like most countries, Korea has its share of citizens who accuse refugees of being economic migrants who are just here because the money is better than at home. One refugee advocate admitted that some foreigners take advantage of the fact that Korea allows asylum seekers to work after six months of their application even before their claim has been recognized, and that they can stay for up to five years while their case is being assessed. Some brokers who know how to abuse the loopholes are actively recruiting foreigners. Among 9,942 foreigners who applied for asylum here last year, 3,264 were rejected. While numbers are vanishingly small compared to other countries, the reaction here is much the same. 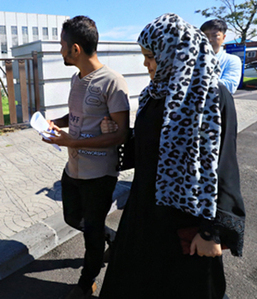 The recent arrival on Jeju Island of 549 Yemenis fleeing civil war and hunger in their country has divided the Korean public between those who want the government to help them and those who claim Korea is full. A petition on the Cheong Wa Dae website on June 13 calling on the government to send them back drew 350,000 signatures in just a week. The Justice Ministry had to raise the number of processing officials on Jeju Island from two to three. 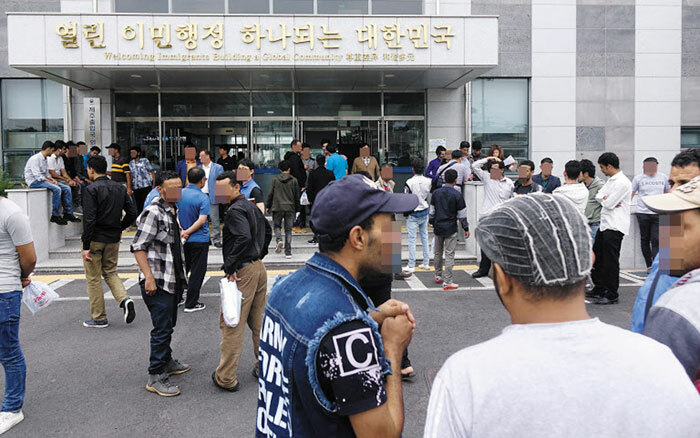 A staffer at the Korea Immigration Service said Sunday, "It will probably take about eight months for the Yemeni applicants to undergo the first stage of their review." The review process is drawn-out. A foreigner can apply for asylum up to three times and legally stay in Korea from two to five years while the application is pending. The last recourse in the review process is a court of law, and the number of court cases rose from 1,076 in 2015 to 3,143 last year, but only a handful won their case at that stage. A court official said, "The number of applicants who actually fall under refugee status is extremely small, but we have no choice but to review all applications." Kim Jeong-do at the Justice Ministry, said, "We need to come up with ways to speed up the process," adding that it does not take that long in the U.S. and Europe. The number of applicants is expected to reach 18,000 this year.